Arrive at IKA Airport (Tehran), where you’ll greet and get assist from our representative and be transferred to your hotel and Check-in. The remainder of the day is free to relax, Overnight Tehran.. Experience Golestan Palace, the UNESCO World Heritage designated, and Royal Jewels Museum containing priceless jewels, including one of the greatest diamonds in the world, Darya-e-Noor. Drive to Darband via the longest street in Tehran, by the name of Valiasr to have dinner in local restaurants, O/N Tehra. Fly to Shiraz in the morning .On today`s city sightseeing visitKarim Khan Citadel, Bazaar-e-Vakil. Later, we’ll head toward Nasir-ol-Molk Mosque and Eram Garden, Overnight Shiraz. Experience a great historical day to Visitthe mighty ancient site of Persepolis, UNESCO World Heritage-designated and get up close to the famous well preserved style structure, then slow; the pace down and give yourself a chance to uncover its hidden treasures. Afterwards explore charming Naghsh-e-Rostam ,Drive back to Shiraz to visit Quran Gate and Hafez Tomb ;O/N Shiraz. 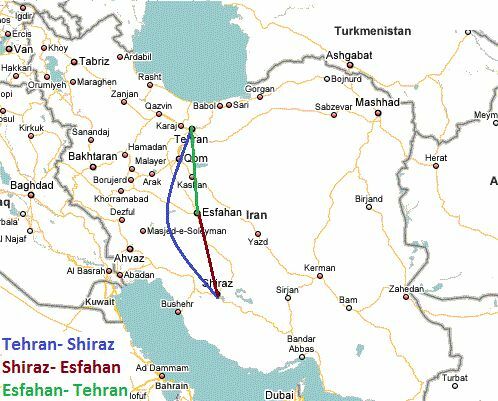 Today you`ll drive to Esfehan, en route visit Pasargadae,UNESCO World Heritage-designated, The Tomb of Cyrus the great. At night get local the world -wide famous bridge of Esfahan over "Zayandeh-Rood" river called sio se pol (33 bridges), where you can drink your afternoon cup of tea in an old traditional tea-house, O/N Isfahan. The beautiful city of Isfahan is enchanting and atmospheric, so prepare for your upcoming adventure. Enjoy a full day city tour including Chehel sotun (40 pillars), Naghshe Jahan Square(Ali Qapu Palace, Imam Mosque,Sheikh-Lotfollah Mosque, Bazaar), Overnight Isfahan. This morning you`ll drive to Tehran, en route stop in Kashan with the chance to visitFin Garden and Tabatabaeiha House. In Tehran enjoy your farewell dinner in and Traditional restaurant with live music, O/N Tehran.